Although the gloriously maverick original music of Charles-Valentin Alkan (1813–88) is now beginning to be become familiar, his equally idiosyncratic transcriptions have not yet been systematically documented in recordings. Alkan published a series of three albums of transcriptions, which have never been recorded in their entirety before - this release is the first in a pioneering project to do just that. The composer whose music Alkan transcribed more than anyone was Mozart, and this CD presents the complete Mozart/Alkan transcriptions. 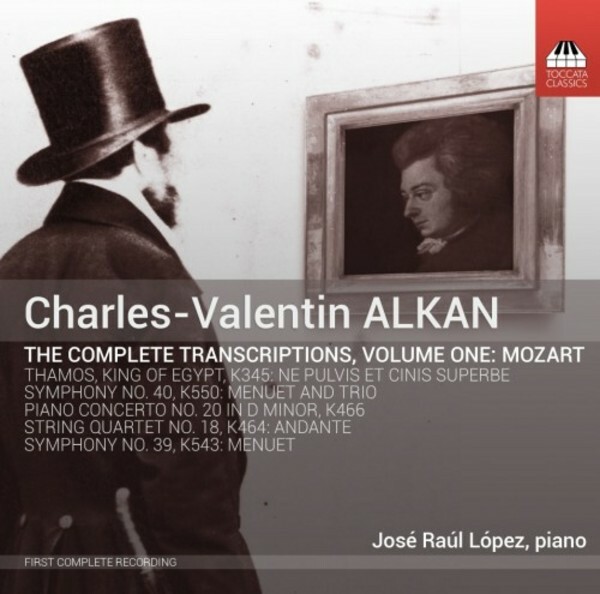 An extended essay by the pianist on this CD, José Raúl López, examines Alkan’s art as a transcriber with detailed reference to Mozart’s originals and Alkan’s keyboard solutions. José Raúl López is Coordinator of the Keyboard Department at Florida International University in Miami. His interest in contemporary music has resulted in many world premieres and collaborations with composers, along with the keen pursuit of resurrecting rarely heard works by Romantic and Classical composers. He received his MM and DMA degrees from the University of Miami School of Music, where he studied with Dr Rosalina Sackstein, a former pupil of Claudio Arrau and Rafael de Silva. His previous recording for Toccata Classics presented the complete piano music of Riccardo Malipiero (TOCC0129).